Sir Edwin Henry Landseer RA was born in London on March 7, 1802. His father, John Landseer A.R.A., was an engraver. Young Edwin was a prodigy and his talents were recognized early. He took lessons from several artists, including his father and Benjamin Robert Haydon, an English painter who specialized in grand historical paintings. He was the one who encouraged Edwin Landseer to do dissections so that he could fully understand the skeletal structure and musculature of animals. Landseer was only 13 years old when he started exhibiting his works at the Royal Academy in 1815. At age 24, he was elected as an Associate and in 1831, at age 29 he was already an Academician at the Royal Academy. 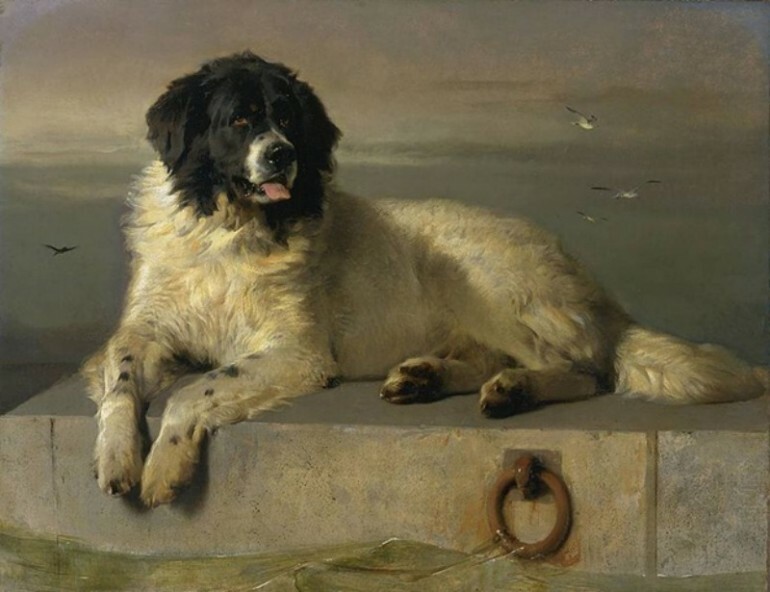 In 1850, Landseer was knighted. In 1866, he was elected as President of the Academy but he chose to decline. Landseer was a very accomplished painter, and had excelled in painting animals, especially stags, dogs and horses. Despite that, he was very popular due to the four monumental bronze lion sculptures he did for Trafalgar Square, which were installed around the Nelson Column. 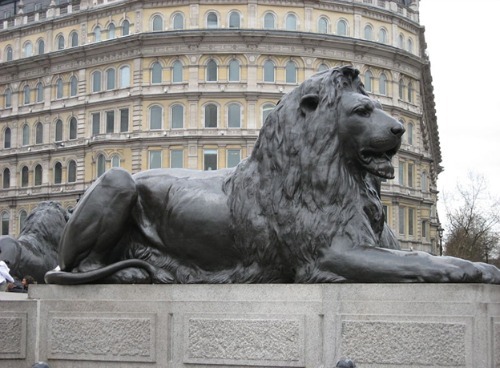 It took about 10 years and a half after Landseer received the commission for the lions to be installed. While their sitting positions are similar, even in the way their tails curled around their body, the mane and countenance of the lions are different from each other. Today the lions of Trafalgar are better known as the Landseer Lions. Edwin Landseer made important contributions to English sculpture and painting and was very popular during the Victorian era. He gained significant professional and social success due to his talents. Writers Thackeray and Dickens were his friends and he was Queen Victoria’s favorite painter. He was known to humanize his subjects, adding a sentimental narrative to his animal portraits. Some of his famous dog portraits include “Dignity and Impudence” and “The Old Shepherd’s Chief Mourner.” Among his paintings of stags, the most famous is “The Monarch of the Glen” while for horses, it would be “Shoeing” that he created in 1844. In 19th century British art, Landseer was considered a very notable personality and most of his paintings now grace many museums in Britain, including London’s Wallace Collection, Kenwood House, the Victoria and Albert Museum and Tate Britain. He was unrivalled when it comes to animal painting and his income and fame came from the publication of engravings of his work, most of them created by Thomas, his brother. He was popular across social classes and middle-class homes were decorated by reproductions of his works, while the aristocracy supported him fully. As a favorite of Queen Victoria, he received several commissions to do portraits of a variety of royal pets. Landseer was later asked to do portraits of gamekeepers and ghillies and the Queen requested a portrait of herself one year prior to her wedding to Prince Albert. Landseer also taught the royal couple how to do etchings and painted baby portraits of the Queen’s children, often with a dog present. He also did two portraits of the royal couple dressed for costume balls. In 1873, the Royal Academy exhibited one of the last paintings of Landseer, a life size equestrian portrait of Queen Victoria. Edwin Landseer had a special association with the Scottish Highlands, which provided him with many animal and human subjects for his paintings. Aside from his animal art, Landseer also did illustrations for novels, genre paintings and etching. He was an accomplished plein air painter and his outdoor sketches were at par with the works of John Constable. Landseer’s animal paintings brought him great recognition because he added a wealth of virtues to his animal subjects, that were popular during the Victorian era, including conquest, courage, pride and nobility, as well as female subservience and male dominance.